1) H.H. Ali Jah, Zubdat ul-Umara, Bahadur ul-Mulk, Farzand-I-Arjmand, Maharajadhiraj Raj Rajeshwar Shrimant Malharrao II Holkar VII Subadar Bahadur, Nusrat Jang, Maharaja of Indore (s/o Keshribai) - see below. i) Viqar ul-Umra, Shrimant Sardar Govindrao Chinnaji Bolia [Baba Sahib]. m. (first) at Maheshwar Fort, 31st May 1865, Shrimant Akhand Soubhagyavati Sitabai Raje Sahib Bolia, daughter of H.H. Maharajadhiraj Raj Rajeshwar Sawai Shri Sir Tukojirao II Holkar XI Bahadur, Maharaja of Indore, GCSI, CIE. m. (second) Shrimant Akhand Soubhagyavati Manjulabai Sahib Bolia. He d.s.p from natural causes, 14th December 1895, when his widow adopted a son and successor on his behalf. 1) Maharajkumari Shrimant Bumaji Gadubai Raje Sahib Holkar. 1833 - 1834 H.H. Maharajadhiraj Raj Rajeshwar Shrimant Sawai Shri Martandrao Holkar VIII Bahadur, Maharaja of Indore. b. 1830, eldest son of Shrimant Sardar Bapu Holkar, educ. privately. Adopted on behlf of Mharaja Malharrao II by his widow Maharani Gautama Bai [Tai Sahiba], with concurrence of Maharani Krishnabai, at the moment of his death, 27th October 1833. Installed on the gadi at the Rajwada, Indore, 17th January 1834. Deposed by favour of Harirao, 2nd February 1834. He was sent as a prisoner to the Deccan, where he renounced all rights to the throne for himself, and any descendants, in return for an annual stipend of Rs 500 p.m. Allowed to proceed to and settle in Poona, where he was placed under the supervision of the local Magistrate and his movements restricted to the limits of that city. 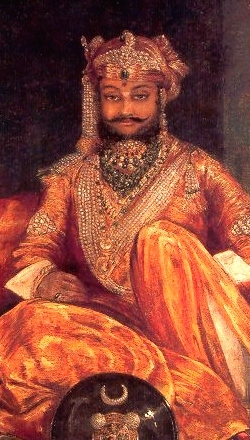 The Maharani Regent Krishnabai put forward a proposal for his restoration to the gadi following the death of Maharaja Harirao in October 1843, but this was dismissed by the British authorities and his earlier renunciation upheld. Put forward again by several leading nobles with the support of Maharani Krishnabai following the death of Maharaja Khnderao in March 1844, but again rejected on the same grounds. m. Shrimant Akhand Soubhagyavati ...bai Sahiba, who returned to Indore after the death of her husband. He d.s.p. at Poona, 2nd June 1849. 1) Maharajkumari Shrimant Sakhabai Raje Sahib Holkar [Shrimant Akhand Soubhagyavati Sakhabai Raje Sahib Phanse]. b. at Maheshwar (d/o Harikabai). m. at the Juna Rajwada Palace, Indore, 1834, Raja Shrimant Bhaurao Phanse, of Tarana (d.s.p. at Tarana, 17th July 1853), Chief Minister of Indore and Principal Councils of Regency 1843-1848, eldest son of Raja Shrimant Rewajirao Phanse, of Tarana, Chief Minister of Indore 1834-1836. She d.s.p. at Tarana, before 1855. 2) Maharajkumari Shrimant …bai Raje Sahib Holkar. b. at the Juna Rajwada Palace, Indore, before 25th June 1841 (d/o Ghainabai). 1843 - 1844 H.H. 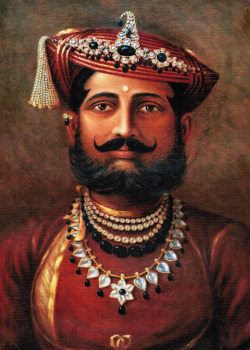 Maharajadhiraj Raj Rajeshwar Sawai Shri Khanderao Holkar X Bahadur, Maharaja of Indore. b. at Jotsikhera, 1829, son of Shrimant Sardar Bapujirao Holkar, of Jotsikhera, educ. privately. Adopted by his cousin, Maharaja Harirao Holkar IX nd his senior wife Maharani Ghainabai, at the Rajwada, Indore, 2dh July 1841 (recognised by the Government of India, 30th August 1841). Succeeded on the death of his adopted father, 24th October 1843. Installed on the gadi and presented with a khilat of recognition from the Governor-General, at the Juna Rajwada Palace, Indore, 13th November 1843, and reigned under the Regency of his adoptive grandmother, H.H. Maharani Krishnabai Maji Sahiba. He d.s.p. unm. at Maheshwar Fort, 17th February 1844, without having adopted a son and successor or assigning that responsibility to his widow or mother (succ. by a distant kinsman). 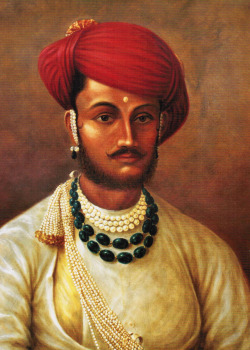 1) Maharajkumar Shrimant ...rao Holkar Bahadur. b. at the Juna Rajwada Palace, Indore, 28th December 1853 (s/o Bhagirathibai). He d. 4th April 1854. 2) Maharajkumar Shrimant Janrao Holkar Bahadur. b. at the Juna Rajwada Palace, Indore, 185x. He d. there, 20th February 1857. 3) Maharajkumar Shrimant Shivajirao Holkar Bahadur [Bala Sahib], who succeeded as H.H. Maharajadhiraja Raj Rajeshwar Sawai Shri Sir Shivajirao Holkar XII Bahadur, Maharaja of Indore (s/o Bhagirathi Bai) - see below. (1) Shrimant Jagdeependra Singh Malharrao Holkar, educ. Daly Coll, and Govt Coll of rts & Commerce, Indore. He challenged the succession of Maharani Usha Devi on the grounds of strict primogeniture. Settled in Bhopal. (2) Shrimant Anshumant Rao Malharrao Holkar [Khase Sahib], educ. Daly Coll, Indore. (3) Shrimant Gautam Rao Malharrao Holkar, educ. Daly Coll, Indore. He has renounced the material world and became a sadhu at an ashram in Barwaha, on the banks of the river Rewah. (1) Shrimant ...bai Sahib Holkar (born between Anshumant and Gautam). ii) Shrimant Vatsalabai Sahib Holkar. b. at Indore, 17th February 1917.
i)	Shrimant Subhadrabai Sahib Holkar. b. at Indore, 30th March 1919.
ii) Shrimant Tara Bai Sahib Holkar. b. at Indore, 9th July 1927. 1) Maharajkumari Shrimant Keshribai Raje Sahib Holkar. b. at the Juna Rajwada Palace, Indore, October 1852 (d/o Radhabai). She d. at Indore, June 1853. 2) Maharajkumari Shrimant Sitabai Raje Sahiba [Shrimant Akhand Soubhagyavati Sitabai Raje Sahib Bolia] (d/o Bhagirathibai). m. at Maheshwar Fort, 31st May 1865, as his first wife, Viqar ul-Umrao Shrimant Sardar Govindrao Bolia [Baba Sahib] (d.s.p. 14th December 1895), son of Shrimant Sardar Chimnajirao Bolia [Appa Sahib], the adopted son of Maharajkumari Bhimabai - see above. (1) Shrimant Sardar Kaushik Ranjeetsingh Holkar. (1) Shrimant Akhand Soubhagyavati Jaymala (Preeti) [J. Suryavanshi Patil]. i)	Dr Shivaji Rao Martantrao Holkar, educ. (MB BS).